A few years ago I hired a super high priced coach to help my business grow. He is a world renowned marketing person and a stand up human being and I thought that if he would just tell me what to do I would FINALLY be able to focus and make the big bucks. He looked around all the different parts of my business in horror and said that I had way to many moving parts. That I would HAVE to scale things down to one thing and focus on that forever. Because of what I had going at the time, he picked real estate marketing. I had written a few books about this topic, ranked well in Google and had been a Realtor in a past life so I was knowledgable. And I like real estate marketing… well enough, I guess. I had spent a fair bit of time trying to make them courses and books and training. And they were doing okay, but they didn’t set my heart on fire at all. The thought of focusing on them, only, for the rest of my life was the most depressing thing I had heard in a long time, but “the man” said that would work. So I spent a while trying to do just that and feeling more resentful and depressed by the day. I didn’t want to learn anything new because I would just have to figure out how to make it apply to real estate agents (again). The worst part of all of this is that my special gift from God is to figure out other people’s businesses! I have helped hundreds of small business owners find focus, but I was floundering myself. I knew I loved marketing and writing, but there didn’t seem to be a clear path. So I shut down my jewelry store and opened a digital products store (way more in line with what I do in real life). I just crossed the 2,000 sales mark and it is super easy for me! Ha! I showed those big time, serious marketers a thing or two, didn’t I. But then I had the bug. I love old things and thought it would be super cool to sell a physical product too so I opened up another store selling vintage. That one is doing great too! I have sold more Etsy related marketing products, courses and coaching in the last 3 years than I have sold real estate training in 11 years. With all this cool new stuff I had to make sure that I did have FOCUS and that it wasn’t just a blob of nothing again. If you have ALL THE THINGS and want to get a wee bit more straight, here are my top tips! How Can You Find Your Focus? My story is great but if YOU don’t DO something after reading it, then it is just a great tale. Here are some things you can do starting today! I was mad at the coach man for a long time. Why the hell didn’t he tell me about how much I would love sales when I had something cool to sell…. oh wait, that’s right, I didn’t know about it then! When you are trying to “find your passion” there are a million ways to screw it up. I thought because I knew I loved marketing that would solve all my problems, but that wasn’t specific enough. It is easy to think that the thing you love will already be in your life, but you might not have even met it yet. Videos… YouTube, live, what the heck are stories? Mine all start with marketing because that IS my passion and then branch off into parts of it I like. 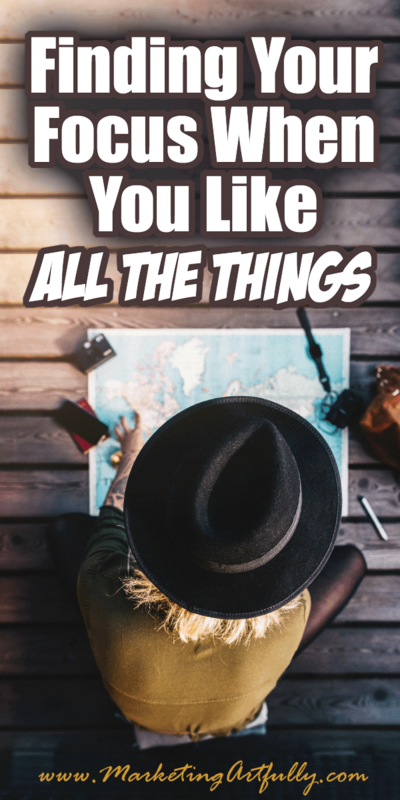 By doing this you will discover things that you are curious about, things you already do you would like to learn more about and what interests you on a day to day basis. So here is the key, you won’t know what you love until you find it! And you will never find focus until you love something… deep huh? Earlier this year I was suffering a bit with depression (a lifelong battle) and I decided to take a course from Dr. Axe on Essential Oils. I wanted to learn how to use the scents to help me feel better and that led me to starting a new, fun website that I am working on now. Will this be something that changes my business life? I dunno! I started the Etsy stores as a hobby and they turned into a real part of my business. Stop trying to judge yourself before you get started! > Exercise: What is one thing that you have been interested in that isn’t practical? Take a course, read some blog posts, watch some YouTubes about it! I have been curious all my life and willing to try new things…yay! But they don’t always work out…boo! 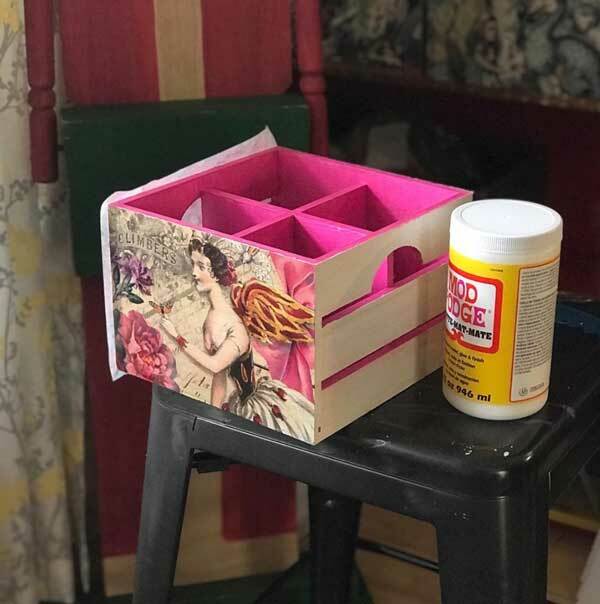 For example, years ago I thought I would want to decoupage bottles and spent a good two months getting ready, buying supplies, etc. only to find I HATED doing that. But this year I decided to do a big boxes project with custom designed tissue paper and… wait for it… decoupage! I loved it this time. The reason it made more sense this time was that I MADE the designs rather than just chopping up pieces of paper. More about what I like to do later! I also have tried photography a bunch over the years (my husband and mother-in-law are “real” photographers) but generally hated taking pictures of landscapes. But then I figured out photography could be for products and now I am in love again! > Exercise: What is one thing that you thought you would love but then gave up? Can you make it match something you are working on today? I am sticking this in the middle here because you might be FREAKING out right about now. 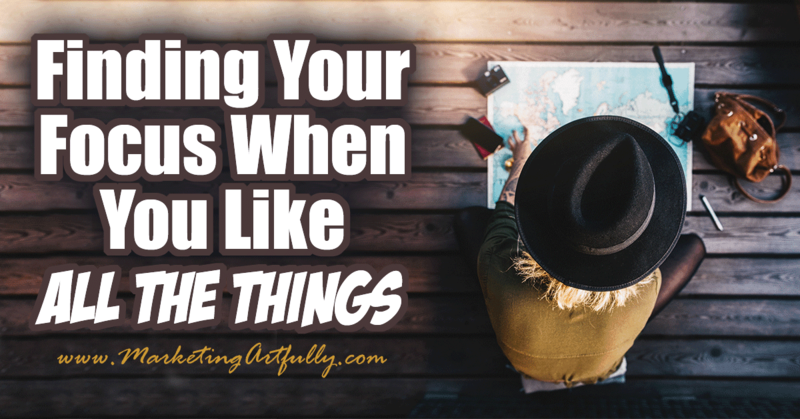 There are either so many things you love or so few things you think will work. There are things you have tried and failed at and things that you are just…not….qualified to do. There is no one on the earth who thinks as badly about your failures as you do. There is no one who says meaner things to you than that little voice in your head who is super ready to throw you under the bus for wanting to try something new. There is no greater fear than trying something and then failing… again. Don’t beat yourself up, just do all this very lightly and flail around until you find your passions. > Exercise: No cheating on this one! You have to give yourself a break. No judging you during this time of finding your focus. Okay, this is one I do every couple of weeks to figure out what I should functionally be doing in my business. I write down ONLY the top three things I like to do. Then I look at my week and see how much of it is spent doing what I like to do. When I first started doing this practice I was doing very little of that, now the majority of my weeks are this and the things I don’t love doing have to hang out on the edges! > Exercise: Write down three things you love to do. My pal Kirsten’s are texting people, working out and sales, yours can be anything you like the most. I was 47 years old when I started my first Etsy store. I had been doing marketing for 14 years at that point and doing the real estate marketing for 8 years. I thought I had all the things that I needed to be successful, I just wasn’t doing it right. Come to find out, I hadn’t found what I liked the most yet. Over the last three years my life has grown immensely. My interests have blossomed even more. I jump out of bed in the morning because I can’t sleep with all the cool ideas I have to write down. And I am happy. But you may not know yet and that might be making you unhappy. You may be me 3 1/2 years ago looking down the barrel of a life filled with something that was just okay. Don’t give up! Just keep trying! Another friend had tried doing affilate marketing and making websites. She was famous for jumping from thing to thing and then she took a job with a non-profit. Wait, what? She figured out that she didn’t like being an entrepreneur, she likes using all those skills she has to help people in a different way. 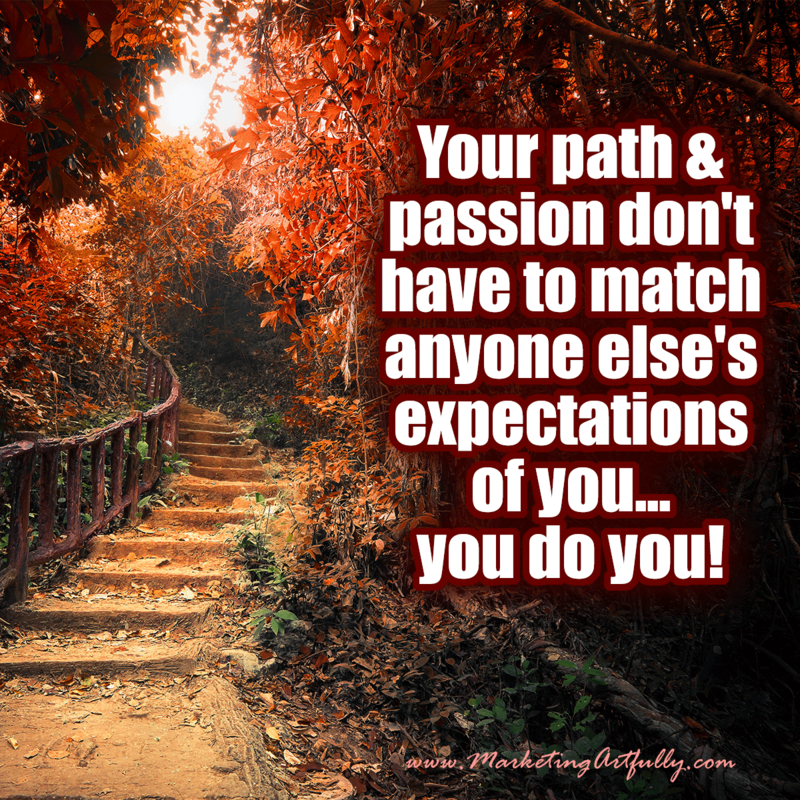 Your path and passion don’t have to match anyone else’s expectations of you… you do you! One thing that was holding me back from trying something else new what the fear that “people” would think I was flakey. I had done a bunch of different things and now I was going to add being an Etsy store owner to it? And start talking about product photography? And digital products? What the actual heck! I was going to look like I didn’t know what the hell I wanted to be when I grew up. And I am sure some people decided that I wasn’t for them. But I found a whole new tribe of people who are creative and fun and interesting. Now, many of real estate agent friends are fun, but they are not especially creative nor do they sell products (except houses). > Exercise: Think about the worst thing that could happen if you try something new. Would all your current customers leave? Would your contracts all fall apart? Would you be branded a loser? Or would you maybe find out what you love doing and be a huge success in a few years…. something to think about. All the stuff you have been doing up until now is not wasted time. Maybe you have been growing an Instagram following or an email list. Maybe you have a website or a store and you know how to do ecommerce. One of the reasons I was able to launch my new side hustle on Etsy was that I already had people who loved me, even though they might not love Etsy. I made forms for coaches and authors and yes, even real estate agents. I used all the skills I had learned over the years to make my new business parts work faster. Please do not think everything you have done up until now is a waste. Everything you have done until now has given you skills that you can use as you take your next steps. Okay, you may be thinking this was a whole bait and switch article and I would NEVER get to the focus part, but this is the thing. I never found focus until I found something I loved to do. Now that I have passions, I can focus on each part of my business empire for weeks or even months at a time. I can cut out things that do not fit into MY version of a perfect business and say no to a lot more things that I could before. It is impossible to “find focus” … focus is what happens when you are so excited about what you are working on that you live and breathe it. When you are taking notes and learning and excited to launch new products or services. When you find your “thing” focus follows.